The upper had a glove-like fit, according to many commenters. Some users thought the midsole was responsive. One reviewer said the Cloudrush was the fastest shoe they have ever worn. The CloudTec pods worked well in enabling a soft landing and an energized toe-off, a runner stated. A few reviewers thought the shoe did not look durable and felt that it might not withstand long runs. The Cloudrush was not as comfortable as it claimed to be, a customer said. One runner mentioned it was too firm despite the CloudTec pods on the outsole. Another user reported suffering from foot fatigue after wearing the shoe for an entire day. The On Cloudrush received mixed reviews from consumers. Many were satisfied with the performance of the shoe, and some were impressed with the features. However, there were a few complaints regarding the comfort. Overall, the Cloudrush proved to be a reliable footwear that delivered a responsive ride and efficient technology. On Cloudrush: Is it really like running on clouds? So lately, I’ve been very cautious and careful in selecting the right pair of running shoes for me. I recently suffered from ITBS due to (2) reasons – Reason #1, Lack of Training (HAHA guilty as charged) and Reason #2, the running shoes I used for my half-marathon run. A little stretching and rest got my ITBS settled down. However, finding the proper pair shoes was yet another challenge. Luckily, a friend mentioned purchasing a new pair of shoes (ON-Cloud), he said it felt amazing and he had that extra spring. So here I am, with my own pair, trying to find out if it’s really like “running on clouds”. At first, the On Cloudrush looked like I was wearing a pair of golf shoes with the basic color of black & white. However, after actually wearing it with my running apparel, I must say the simple color-way kind of works with whatever you wear. This part actually varies based on the kind of socks you wear. I usually wear ankle socks, but I’m not totally against wearing mid & high socks. During my initial run, I used a pair of ankle socks and had blisters starting on the back of my Achilles heel within the first 3km. A simple remedy for this was for me to switch to a higher length of socks. This was the so-called “Speedboard” or “Cloudtec’ – this is where that spring comes into play. I must say, the product does not disappoint. At first, I was skeptical and figured it might just be a placebo effect of marketing it as “running on clouds” but based on how it felt, I must say, running with these shoes felt pretty darn good. It gave me an extra bounce during those uphill climbs and the cushioning was pretty good. So from the outsoles, it was these small multiple bumps that served key to that so-call “spring-like” bounce or effect. My foot’s landing felt good and well cushioned and my lift felt better than most. I’d recommend purchasing the On Cloudrush if you had the budget. It’s a good pair of running shoes and I’ve used it during one of my sprint events and it did not disappoint. I love the shoes and I’m definitely a fan ON Running shoes after my experience with the Cloudrush. Overall? A light and firm trainer; great for speedy runners with good technique. This is a great looking fast day/ race day shoe. Inspired by a previous shoe – the Cloudracer – the Cloudrush was released by On as a gear that is not just for competitive racing, but also for road running and interval training. It features a variety of elements that were well-received in the Cloudracer, as well as improvements based on consumer feedback. The On Cloudrush is ideal for well-trained runners who want to improve their technique and speed. It will fit best on neutral pronators, or runners who have a medium to high arch. Made from thin, lightweight mesh, the upper supplies ventilation that assures maximum breathability, even during the hottest running day. The midsole and outsole feature the On’s signature design, including the CloudTec elements. These are EVA pods that supply adequate energy with each stride. 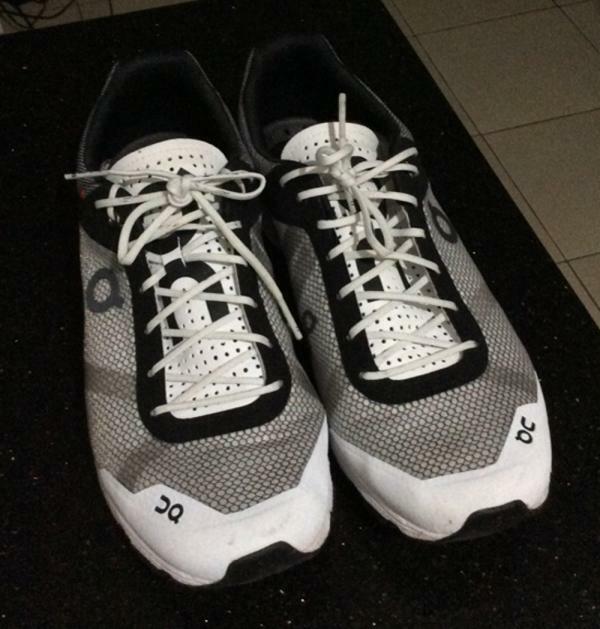 The On Cloudrush has a standard running shoe length and a variety of sizes available. The forefoot and midfoot construction will fit best for runners with a low to medium foot volume. Width profiles for both men’s and women’s versions are in medium. The outsole of the On Cloudrush features a unique layout, which is an EVA layer that has a structure of 18 hollow pods, called the “CloudTec Elements.” These pods compress upon ground contact and release energy at toe-off. This CloudTec element is also integrated in the On Cloud road shoe and all running shoes from ON. There is a gap in the midfoot area, directly under the arch, that prevents the outsole from becoming full-contact with the ground. This is following the notion that having less surface area means less chances of deflection; therefore, there is a better concentration of energy on specific areas. The midsole boasts an exceptionally slim design made from high-grade EVA. It is lightweight yet packed with features. It aims to deliver a dynamic stride by adapting to the running style. Speedboard, a thin Pebax lining, is also present in the midsole. It works by helping the runner adjust accordingly with the pace. The Cloudrush comes in a single colorway of black, white, and silver, and this permits the shoe to remain simple yet a standout. The upper is emphasized with reflective elements to enable visibility in low-light conditions. The upper is made of lightweight mesh material which guarantees adequate air circulation. It keeps the foot cool, dry, and free of moisture. There are exoskeleton strips that provide support and structure as they keep the foot secure. The padded heel collar prevents the foot from slipping out of the shoe. It also protects the skin against abrasions. An inner sock construction allows the runner to wear the shoe barefoot, without the risk of blisters, pressure points, or any other possible injuries.